What is Joggling?The combination of Juggling while Jogging. People who Joggle are called Jogglers. It became a recognised Sport (in America at least) in the early 1980’s when the first races were held at the International Jugglers’ Association’s Annual Festivals. Why Joggle? If you are a Juggler who regularly takes part in parades, then you are already a Juggler who walks while juggling (although there doesn’t seem to be a name for this so I suggest Jalking)! Juggling while running is surely just the next logical step if you find this activity enjoyable! If you are looking for a new way to keep fit and you can juggle then this gives a bit more of an overall body workout as you are using your arms to juggle and your legs to run. It is especially fun if you can find a friend or two to join you. This can be a very social activity. If you can maintain a Juggling pattern while running, then this will help improve your hand/eye co-ordination as you will become even better at keeping patterns in the air and avoiding drops. A level of fitness:to be able to run over whatever distance you have decided to cover. Basic Juggling Skills: The Cascade with 3 balls is probably the most common pattern that people use when Joggling. Make sure you can cope with maintaining this pattern for much longer than it would take to run/jog the distance you want to cover. Perseverance:Combining two different activities is bound to feel weird at first, but it just takes an amount of perseverance and lots of practice, as well as some excellent advice and encouragement if you visit and bookmark the excellent http://justyouraveragejoggler.com/. Perry Romanowski has created a fantastic one-stop portal for all things Joggling related. Updated all the time, and full of entertaining facts. The World Joggling Championships are held every year during the International Jugglers Association (IJA) Juggling Festival in America. Races include relays, 100 metre races all the way up to 5k. As more and more jugglers get proficient at 5 and 7 ball juggling, new categories and distances of race will no doubt be added to the Competition! 1)The Juggling pattern must be maintained while you are running. You cannot just simply stop juggling for a while and hold all the objects in your hand! 2)If you drop an object, you have to return to the point where the object hit the ground and continue your run from there. Joggling has its own forum on the IJA (International Jugglers’ Association) Website. IJA Joggling on it you can find details of the World Joggling Championships and get all your Joggling queries answered! Unless your pure aim for Joggling is to break records and set faster times, then you are going to perhaps get bored with always just performing the 3 ball cascade pattern while you run, so how’s about learning a few tricks to brighten people’s days as you pass them by? Smiling This isn’t a juggling trick, but it is important to be able to not try and look too serious while you are Joggling! It may cut down on people heckling you as you pass, and you may actually get some smiles back which are always a good encouragement as your muscles get tired! Obstacles There will be times when you are Joggling where you are going to come up against an Obstacle. If it is small enough to jump over and you have enough clearance without people in the way, then you might be able to throw a ball high enough so that you can jump the obstacle and continue the pattern. This trick may take a bit of practice as you never know what obstacles you are going to encounter. It will allow you to maintain a decent speed without having to slow down and find alternative routes round obstacles though! Other Tricks Remember that any people watching you joggle will only see you for a brief amount of time, so don’t worry too much about learning loads of tricks to impress them! You may find that it is yourself that gets bored with always doing a Cascade pattern for the duration of your run, so if you know other tricks then give them a try and see which ones work easily and which tricks don’t! 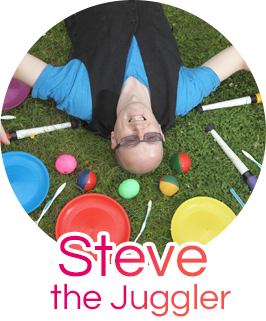 If you have any comments, questions, enquiries or juggling trick suggestions/descriptions, please fill in the enquiry form at the foot of this page or visit the CONTACT STEVE page for many more ways to get in touch (see top menu for the link)! Please note that I am not responsible for any injuries or damage caused by following these trick descriptions. Be safe!